Want to manipulate images without buying expensive software? Browsers are increasingly becoming more advanced and feature many impressive add-ons that help everyday office work. Pixlr is a great example of this by having many features similar to Photoshop. Examples of this are the ability to apply filters, have multiple layers, and keep track of manipulation history. How do I get this add-on? Firstly you need to have Mozilla Firefox installed on your computer, then simply go to a search engine and search for “Firefox add-ons”. The official address is https://addons.mozilla.org. Once on the site go to the search function and look for the term “Pixlr”. In the results you should see Pixlr Grabber – click add to Firefox where it will then be installed to your browser. After installation give it a test by going to any website and right click on the page. In the menu you should see a “Grab” feature that can grab the whole page or a defined area. Also while browsing you can right click on an image and in the menu you will see an “Edit Image” feature that will take the selected image and send it directly to Pixlr for editing. 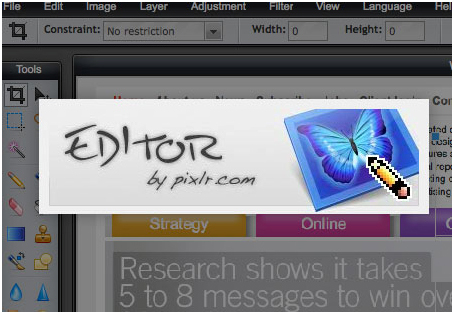 Add a bookmark to the main editor of the Pixlr add-on. This way it takes you straight into the editor where you can create a new image, open an image from your computer & so on. The direct address for the bookmark is: http://pixlr.com/editor/. This great addition to Firefox is completely free and is fast and easy to use. So if you’re looking for a Photoshop alternative that’s free then Pixlr Grabber is Wisetigers recommendation.